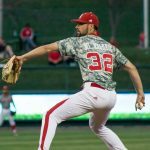 The Nebraska baseball team completed the sweep of Purdue at Hawks Field yesterday, winning 9-5. The Huskers outscored the Boilermakers 39-9 in the three-game series. The 39 total runs is their highest output in a Big Ten three-game series since joining the conference in 2012. Now 7-2 in the Big Ten, the Huskers have now won 11 of their last 13, and remain a perfect 8-0 at home. The Huskers host intra-state rival Creighton tomorrow night, first pitch is at 6:30. The Huskers topped the Bluejays 6-3 in Omaha in game one of their three-game series. Colorado is working to keep the red out of the stands when the Huskers play the Buffaloes in Boulder this fall. The University has sent an email to its season ticket holders offering a special chance to buy tickets to the game, and threatening those who try to sell them on the secondary market. The Huskers will hold thier next to last practice of the spring this morning. The annual Red-White Spring Game is this Saturday, kickoff is at 1:00. Visit www.HUSKERMAX.com for more.